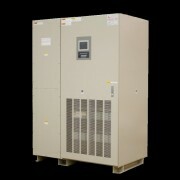 Like all other Mitsubishi Electric UPSs, the 9900B is a three-phase, on-line double-conversion system and features Mitsubishi Electric’s world-renown Insulated Gate Bipolar Transistor (IGBT) technology for enhanced UPS performance and reliability. It enjoys the largest install base, with just under 2000 in North America alone. The 9900B is Energy Star rated.